This entry was posted on Sunday, November 25th, 2018 at 7:03 pm	and tagged with Calgar, Genestealer Cult, Noise Marine, Primaris, Review, Titan, Vigilus, Warhammer 40k and posted in Editorial. You can follow any responses to this entry through the RSS 2.0 feed. I love the honour guard and the gsc bikes. Nice write up as well. These posts are my favourite part of this blog. Cheers man, much appreciated – I really enjoy writing them too, it’s a nice way to share in the buzz of enthusiasm that surrounds a big reveal like this. Speaking of the other Special Characters getting re-done in Primaris scale, I personally hope that the Sanguinor gets re-done absolutely huge, and totally worth it, at some point. I really want it to be worthwhile to use the Celestant-Prime to convert him. The Honour Guard were what really caught my eye there, too. Just unfortunate that they’re so completely covered in Ultramarines iconography. Hopefully they’ll come out with a more generic set at some point. I’d also like it if they get the full range of Power Weapons back, rather than just Axes (like the Index ones) or Swords (all of seen on these new ones). I think Haarken is going to look a lot better without all those skulls. They just throw the balance off too much for a Jump Pack character. On a Terminator or something, they could pull it off, but not here. The Stealer Cult stuff just sent my brain straight to “IT MUST BE MINE!” I’ve been wanting Bikers scaled for regular humans rather than Marines for ages, and that Quad is pretty much what I was hoping for from an Ork Warbuggy re-design. Karanak might have worked out better if he was a bit broader, so there was more room for all the heads. It isn’t really the sort of thing that there are any good real life examples of to work from, tho. I am very much looking forward to that set, too. The Slaanesh Herald is growing on me more and more as I see better pics. Since the original of that Noise Marine was one of the Models that got me into 40K in the first place, I absolutely have to get at least one. And while I can understand the opposing point of view, I for one would be ecstatic if they did a whole multi-pose kit for them in this aesthetic. Updated Goff Rokkerz would be awesome too, especially if they did a drummer with a proper kit as well as the guitars. Good point on making the Sanguinor from the Celestant-Prime, I hadn’t thought of that. I’m guessing from what you’ve said he’s not great in game? Since I wrote this piece it’s occurred to me that they’ll probably say something to the effect of “the arrival of the Cicatrix Maledictum has empowered all who draw upon the warp for their nature, for good or ill” and make a huge, “super” version of the Sanguinor (indeed this could be their get-around for how to bring back Sanguinius without actually bringing back Sanguinius). Seriously, how hacked off would Seth be if they “Primarisised” him without asking first. Smacked over the head with a stun grenade and he wakes up two feet taller! Yeah, I wondered that about the Honour Guard as well. It would be nice if there were more of them, not sure if the two we’ve seen are all there is. I’m hoping they’ll be available separately to Calgar so one could have a larger squad, rather than just the two without ending up with duplicate Calgars. In some ways a generic set would be great, especially for those of us who’re not Ultramarines collectors, but on the other hand the last person in a chapter who should be generic are the Honour Guard, they should be blinged up with all of their chapter specific gear. Now I’ve seen some better pictures of her I think the Slaanesh Herald just needs that long hair tassel snipped off, it throws off all the lines a little. 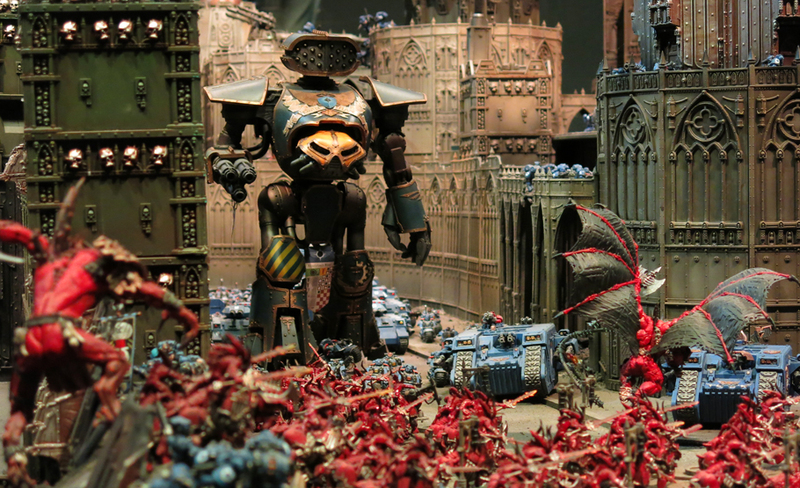 Just occurred to me that one could make a diorama of a whole band rocking out, with the Noise Marine as the centrepiece and various musicians from other sets for the rest of the band. There are plenty of drummers so there should be enough drums to snip off and build a kit. Might finally be a use for that Ironjawz Warchanter as well, he looks like he belongs behind a kit! Yeah, the Honour Guard thing is tricky. They should be totally blinged out with Chapter symbols, but the options are basically: making like 7 different versions, restricting them to just a few Chapters, or doing a generic version. I can totally see doing some tweaks to that Herald, but from the initial preview, I was really unsure about even the basic concept of having a giant harp with a foot Character. Much more fitting when the harp is, itself, a dude. I wanted to do something sort of like that for my display board for the OFCC, have the Noise Marines up on a stage and the Daemonettes forming a mosh pit, but I ran out of time and just used my generic display board instead. Yeah, I hadn’t thought of that – the Celestant Prime is based on a hubcap isn’t he? Price is a bit of a gouge too. Re Bjorn; Ha! True – probably quite a lot of Dreadnaughts feel that way! Re the Honour Guard; perhaps it could be done by creating a generic frame and then providing loads of upgrade sets (heads, weapons, badges) to decorate them. Wouldn’t be straightforward but perhaps not outwith the bounds of possibility. In regards to the Noise Marine that’s very much what I was thinking when I said I’d grumble if they did a full squad like that. As a one off, blast from the past, trip down memory lane, and a chance to really let my hair down and do something crazy with the painting – fantastic, I’m all over it. But if every squad of Noise Marines in every Emperor’s Children army looks like that it’ll overdo the joke. Yup, it’s starting to look very much like the small marines are going the way of squat – proof if any were needed that GW are all shortists! I’ve been waiting for a Primaris Character since the start of 8th. Very fitting that they did Calgar first. Those GSC bikers are amazing. Like wow! Yeah, I think a lot of people were feeling a bit sorry for Calgar (I know I was). He used to be a real hero of the Imperium and since Roboute came back he’s been reduced to second fiddle somewhat so he really deserved to be first to get upgraded. That said his outgoing model is still quite nice, especially when compared to Ragnar and Azrael, hopefully we’ll see those two Primarisised soon because their current models are dire. I’d like to see Dante and Mephiston get the Primaris treatment. Especially Dante. Lots of great stuff here; GW has really been doing a great job with their miniatures over the last few years. Those Cult dirt bikes might be enough to tempt me to start a small force when the codex comes out. They’ve been knocking it out of the park haven’t they? I’m already working on a genestealer cult Necromunda gang/Kill Team but I can see it easily growing into a 40k army now I’ve seen those bikes. Really liking these! The bikers are definitely not overly grimdark 40K, but would be right at home in a post-apoc game. It seems to me that stylistically GW might be reaching out to people who don’t play GW games. These and some of the new Necromunda and Rogue Trader miniatures could very easily be slotted into a non-GW game. I’ve done my fair share of GW bashing through the years, but I must say that some of these new releases are definitely tempting me. Great write up, enjoyed reading this! You’re right enough, they definitely seem to be broadening their aesthetic beyond their core style which can only be good news I feel, a bigger range gives us more to work with! I too have done a bit of GW bashing in the past (still do from time to time), but I always try to keep in mind that the company is not the same as the worlds they create. 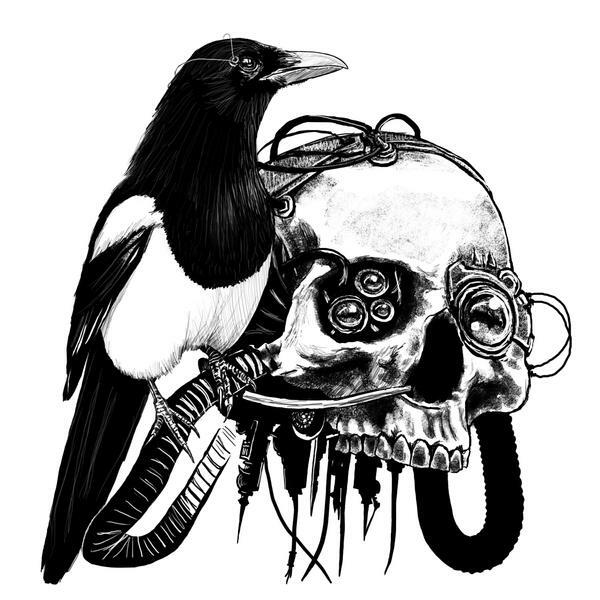 I’m a fan of those universes (Necromunda, 40k, Warhammer, Blood Bowl, and to a lesser extent AoS) and the company is merely the engine by which those worlds are brought to me. When they do things I feel are wrong I’m quick enough to bash them for it so it would be disingenuous of me not to offer them praise when they do things well, and with a lot of their recent work I think they’ve done it very well indeed. No Blood Bowl?! For shame! The Undead team is coming out. Hurrah! It’s actually the team I played in our home league and in the computer game for awhile. The new minis look pretty sweet. Genestealers look pretty good, but seem weird to me. From my understanding, they work by stealth and infiltration, and not direct conflict? So I’m not sure where Biker gang Genestealers come into play. I would mainly want them for Necromunda if anything. Yea, an intercept the messenger mission or stop the caravan sort of thing would work, but not as much use out of that as a non-mounted mini. I kind of like the Noise Marine. Just crazy looking with that paint job. Would I ever find a use for him and/or buy him though? Not likely. I did marvel at the advances in miniature production though. Sculpted hair, splayed fingers (makes a big difference in guitar! ), and they even squeezed a skull onto the guitar. Just amazing. Also interesting to see the differences in the paint job, especially how the leopard print pattern changed. Really makes me wonder where minis will be in 10 more years?! Yeah, I think we’ll see no more Blood Bowl or Necromunda stuff until into the New Year (except maybe from Forge World). They’ve been keeping to the schedule of one release for each per quarter and according to everything I’ve seen on the Warhammer TV channel that’ll be continuing next year so I’m guessing the next wave will be around about March(-ish). That said we’ve got a big weekend of stuff coming up in a couple of days. I’m not usually a big spender when it comes to miniatures (*cough*mostly…ish…) but Undead team, and Delaque and the new books and the Death Guard big box all at the same time – that’s going to give my savings a real kicking for this month. Yep, it’s going to a sucky month. Christmas time for our family, and then GW launches Necromunda and Blood Bowl stuff that I’m dying to have. Last time this happened, I want to say it was Cawdor and Dark Elves? I’ll end up doing the same thing I did back then. Make a list with prices, determine which items might sell out the fastest and how much I’m going to spend. Then backfill the remaining items later. With the rulebooks, I really need to figure out what to keep and what to sell. Sounds like the Blood Bowl Almanac covers all the Spike Journals. But I like them just fine in magazine form, and it would be pretty awesome to hand one of those over to a coach playing that team to reference and browse through before/during play. The Necromunda books though, doesn’t seem to be much incentive to hold onto those at all. If I give the rulebook to a player for a rules lookup…we are going to be looking at different pages and possibly have rules that have been errata’d in the old copy. Yea, I forgot to mention the Delaque last time too. Nice looking minis, and look way easier to paint than the Van Saar. If/when I get them, I imagine they might just jump up the queue, based on how fast I could likely get them done. Yeah, according to the official updated on the Warhammer Community site all the Spike journals will be in the Almanac. I see your point about both being handy though, but as I already picked up the previous Spikes I don’t think there’s any cause for me to buy the Almanac at the moment. As for Necromunda I’ve heard a lot of people saying they’ll be chucking out their old Gang War books and replacing them with the new books and although I’ll get the new books I’m not going to be too hasty about chucking the Gang Wars – I want to see exactly what’s covered in the new book and it’s not like the old books take up too much space (given how many old White Dwarfs, Army Books, Codexes and so on I have kicking around!). Completely agree that the Delaque are looking great, definitely a gang I’ll be adding to the collection in the near future. Well, they say that imitation is the sincerest form of flattery, in which case I’ve flattered an awful lot of people in this hobby! I’m building up a bit of a backlog of things to paint at the moment, and I’m going to have to curtail spending a bit soon anyway, but damn they keep releasing such amazing stuff! Have pity GW – concentrate on the Tau or something else I’m not interested in, let me rest! Nod. My backlog is quite insane at this point. I need to pick out a force to try to put a very large dent into over my time off work in January. I’ve not heard that one (although GW are running a pretty tight ship now, nothing leaks out unless they want it too). Would be good if the Guard did get a bit of love soon though, something a bit more grim and dark than the Cadians. If I can wish list then a plastic kit for Death Corps of Krieg or something based off the Solar Auxilia, but I’d be happy with new Steel Legion.